Calculated Risk notes that Tanta passed away a year ago. Although I never knew her, I read her postings over there with as much delight as anyone, and teared up on a number of occasions when the sad news of her passing first came out, and again tonight being reminded of it. Such a lively, funny, authentic writer. And so much to teach us. I'm struck though, by her life course. I am guessing that she touched far more people, and had a larger impact on the world, as a result of her blogging at Calculated Risk than she ever did in the earlier phase of her professional life. So her choices of how to handle her life after receiving a diagnosis that ended up fatal greatly increased the meaning of her life. It's inspiring. 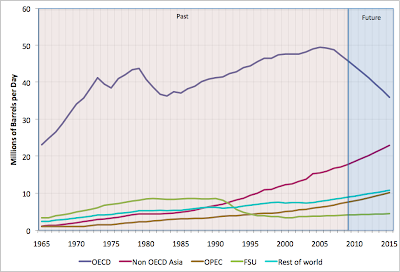 Value of goods and services produced per barrel of oil in various countries, 1980-2008. 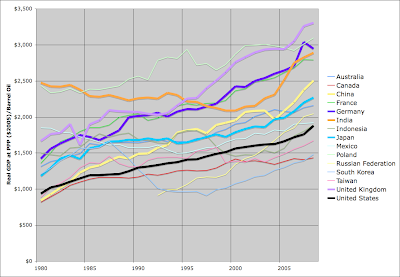 Comparisons are done at purchasing power parity, and corrected for inflation to 2005 dollars. 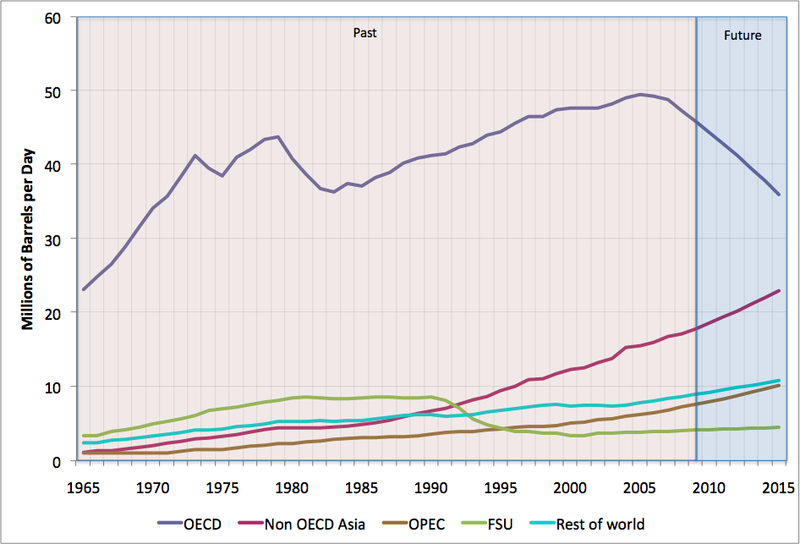 Sources: IMF World Economic Outlook for GDP data, BEA table 1.1.4 for deflator, and BP for oil consumption data. 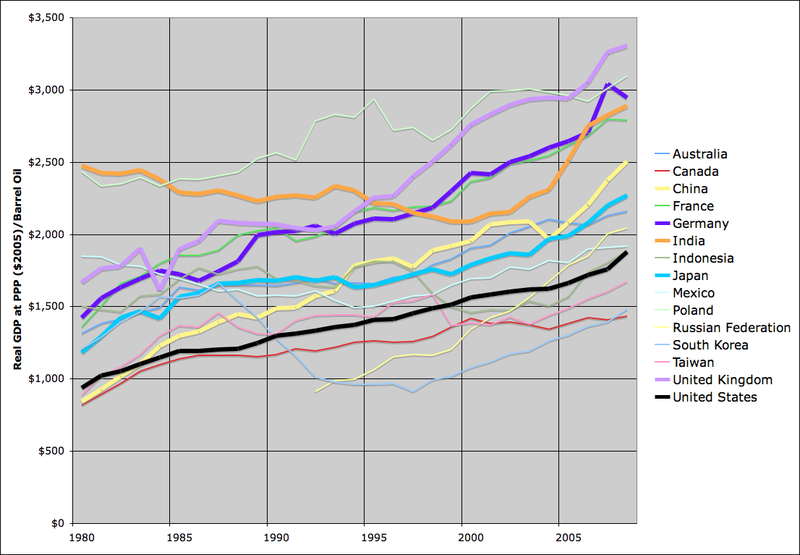 Of the many economies that gorged on debt in the boom years, Dubai stood out. In the space of a few years the emirate’s investment arm, Dubai World, racked up $59 billion in debt, borrowing to build lavish developments like a giant island shaped like a palm tree to entice celebrities like Brad Pitt, and to invest in glittery properties like the MGM Grand Casino in Las Vegas. Now that the boom has gone bust, both in Dubai and in the United States, Dubai is stuck with a glut of real estate that no one wants to buy or rent. Creditors and markets had always assumed that when push came to shove, its oil-rich neighbor Abu Dhabi would bail out Dubai. But that assumption was called into question this week, and the resulting fear that Dubai might not be able to pay its bills sent a wave of uncertainty rippling through markets just as investors thought the worst of the global financial instability was over. I don't propose to investigate this in any detail, but I wanted to quickly suggest a likely framework for thinking about this. Whenever any genuine and important new trend appears, it's human nature for people to get overexcited about the possibilities, borrow too much money, bid prices up too high, and then crash. Think South Sea Bubble (prospect of trade with South America) in the 18th century, the Railroad boom in the 19th century, and the Dot-com bubble recently. So it should surprise no-one that the new-but-ongoing era of high oil prices, which promises to make the Middle East a very wealthy and important region over coming decades (absent more war and revolution), should occasion a bubble or two. The fact that things got a little ahead of themselves does not mean the underlying trend is not important - just as trade with South America, railroads, and the Internet, all did prove extremely important trends over many decades. 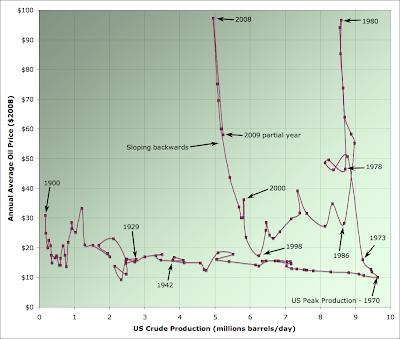 Oil price versus US crude production 1900-2009. 2009 is through Aug for production, and through October for price. 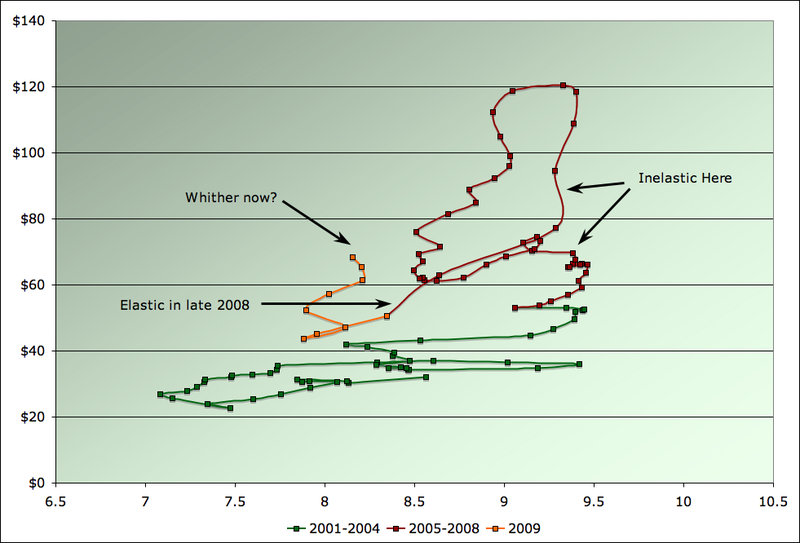 Prices are inflation adjusted to 2008. 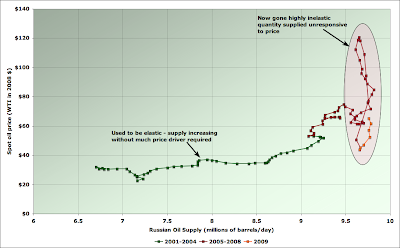 Sources: BP for prices, and EIA for production. How Elastic is Saudi Oil? 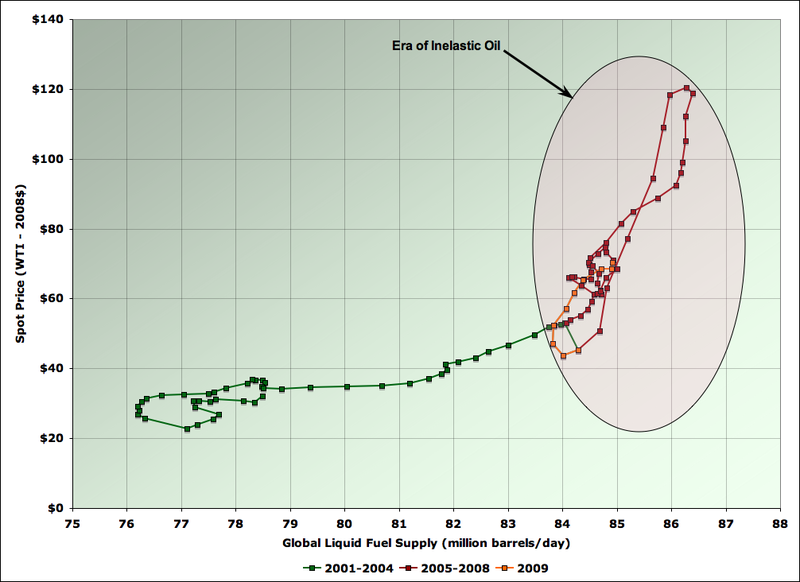 Spot oil price versus Saudi Arabian oil supply, 2001-2009. Source: Supply is an index constructed from EIA, IEA, JODI, and O&GJ estimates. 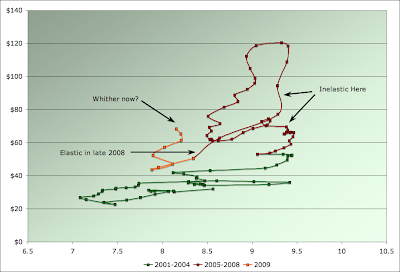 Price is spot price of West Texas Intermediate according to EIA , adjusted for inflation using the CPI to Jan 2008 dollars. 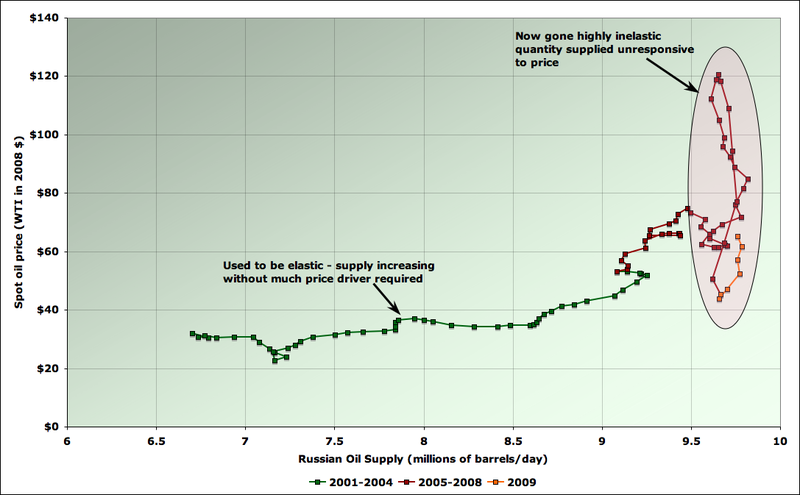 Spot oil price versus Russian oil supply, 2001-2009. Source: Supply is average of EIA, IEA, estimates. Price is spot price of West Texas Intermediate according to EIA , adjusted for inflation using the CPI to Jan 2008 dollars. 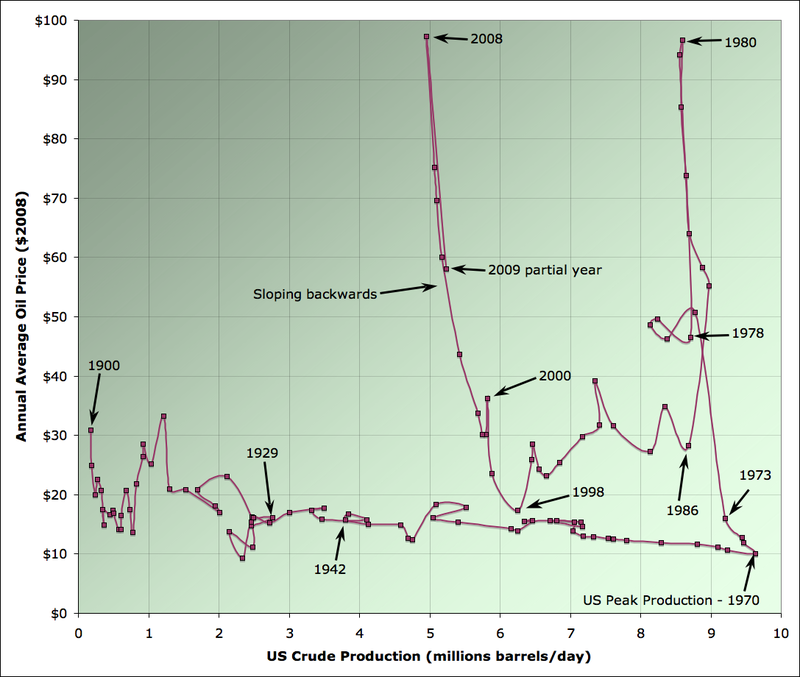 Ok, suppose you'd never heard of peak oil. Or you didn't believe in it. What could you conclude from the recent history of price and global oil supply? I used to blog over at The Oil Drum pretty regularly. After a near two year hiatus, I am now returning to the fray under my own masthead. I tend towards long, quantitative, explorations of problems of national/global significance - whatever worries me most (and there's plenty to worry about these days). Blogging will be probably be fitful as time allows - this will mainly be written between the hours of 6am and 8am - it may or may not be early warning, but it's definitely early morning.